Exeter Cathedral is probably the most well known landmark in the whole of Devon, and it was a great pleasure to work with them on a number of projects that they needed designs for. I provided a menu design for their restaurant, two logo designs for the Cathedral bellringers, and a greeting card design to sell over the festive period, all to their specifications. First of all, the cathedral hired me to modernise their menu for the restaurant. The brief was upmarket and sophisticated to fit in with the historical surroundings. I mocked up a few designs including one based on the famous West Window. Our main focus was to create a menu that would appeal to all demographics that use the Cathedral cafe. Also we decided the text should be easy to read, and all the menu items should be grouped together in a way that was simple to understand. As a result the menu design chosen encapsulates all these principles, and will be used for years to come. I also proposed the idea of having a fun page for children visiting the Cathedral. I included a few activities that fitted into the historical nature of the building. However, in the end, we felt there were not enough food options for children to warrant a whole menu, although coming up with the games was good fun. Consequently, after weeks of consultation between staff at the Cathedral, they chose this final design. We all agreed it was simple, easy to read, and fitted into the historical aesthetic of the building. Before we can use the design in the cafe, we must add the cathedral’s new menu items. Once this is complete, the cafe will use this menu for years to come. 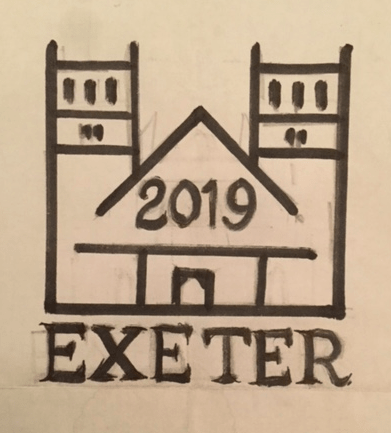 Afterwards, the Cathedral bellringers asked me to vectorise two logos for their upcoming competitions for use on promotional material and various souvenir items. Because the team are entering into a national bellringing competition, they needed these logos to represent themselves amongst the other competitors. 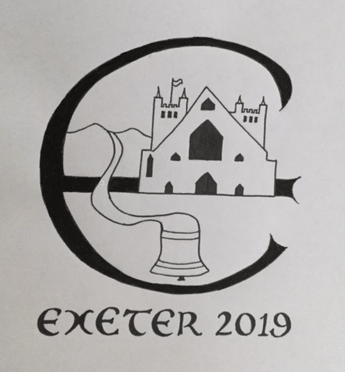 The head of the Exeter bellringers organisation sent me hand drawn samples of the two designs they wished to use, but they needed vector versions so that could easily use them online, on merchandise, and on advertising. Even though I had the designs, they were not clean enough to do a simple vector trace, so I had to recreate them from scratch. After recreating the logos, I provided Adobe Illustrator, Photoshop, and transparent .png files for their use, and for the use of their professional printers. Exeter Cathedral’s yearly Christmas card collection is well-known throughout the area. So to create one of their cards for Christmas this year was a great pleasure. Furthermore, the money from the sale of these cards goes towards the general Cathedral fund, and helps keep this historic building available for the next generation. The Cathedral chose this design after they decided between a few variations I had supplied. Once my Exeter Cathedral illustration goes to print, the Cathedral shop sells it over the festive period of 2018. It was such a joy working with Exeter Cathedral on these projects, because feeling like I’ve added just a small bit to the illustrious history of such a great building is fantastic. Finally, it makes me proud that a great Devon landmark will be using my designs, and thousands of visitors will see them every year.